It's always an immaculate event; the white dress, the church bells, family and friends, and the traditional vows repeated by a passionate couple. Many elements of the archetypical wedding echo the long-standing formality and tradition of weddings. It is everyone's dream: Find love, get married, and live happily ever after. Although varying in customs, all weddings have a symbol: wedding jewelry. For typical weddings, a band or wedding ring is the prevailing piece, typically composed of gold, silver, brass, platinum, or a different preferred material. As such, finding the perfect ring is often one of the most time-consuming tasks leading up to a wedding. Let's face it; you are not the only one out there looking for a great deal on a wonderful ring, so it makes sense to take on a competitive mindset. Statistics do not lie. If 6,200 couples wed every day, then that means 12,400 rings change hands just during those weddings. What are the chances of getting the one you want at the price you want with that much competition? Jewelry stores are an option, if you want to start your marriage in the poor house. Thanks to Gracious Rose, your problems are gone. As an online provider of wedding jewelry, Gracious Rose offers a selection of over 3,500 handmade products guaranteed to suit all palates! Even if nothing catches your eye, custom-made pieces are available. Simply tell us about your perfect ring, and we'll make it yours! The traditional rhyme of "something old, something new, something borrowed, something blue" has historical significance dating back to 19th Century English folklore. It is mainly about wedding rites, fertility, and good luck. Moreover, often, it is highlighted in the form of gold adornments used in wedding jewelry. Today, aspects of wedding jewelry go beyond the bride and groom. Some brides bestow gifts to their bridesmaids to wear with their dresses. It can be in the form of bracelets, necklaces, earrings, or charms. For those brides who select a style of religious ornamentation for their ring, they can choose matching cuffs, bangles, or earrings for the bridal party. Regardless of the period, the king of wedding jewelry is the ring, which symbolizes the love and devotion the groom has for his bride. When choosing a ring to wear for eternity, don't settle for second best. You deserve top-notch service and a vast array of selections. Visit GraciousRose.com to learn more about the plethora of elegant wedding jewelry pieces available in all designs, from contemporary to classical. 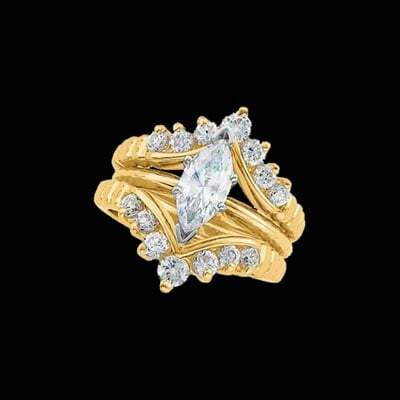 Make your wedding day special by choosing only the best ring. Find your perfect wedding jewelry at GraciousRose.com now!